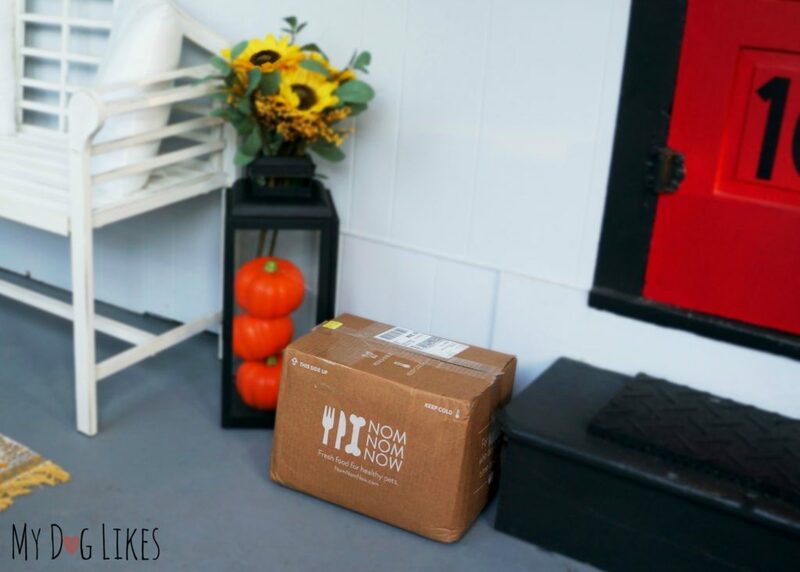 NomNomNow Review - Seeing the Difference Whole Food Can Make! 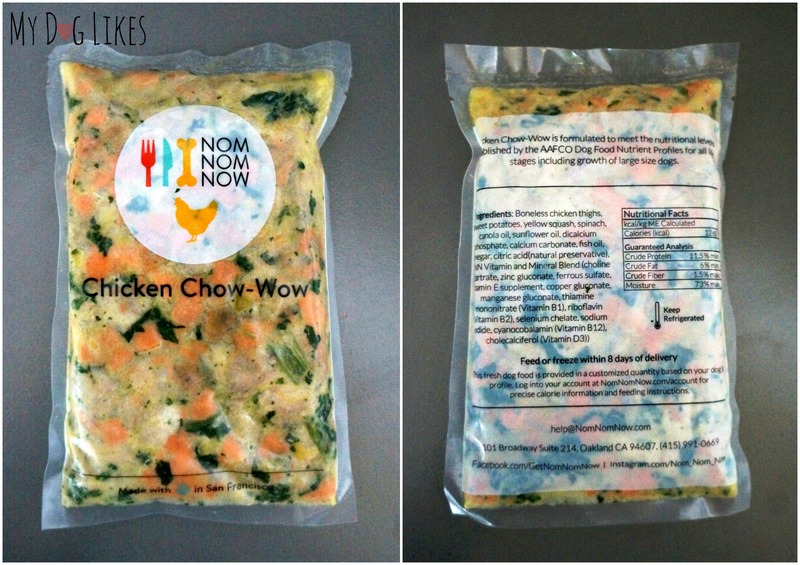 NomNomNow Review – Seeing the Difference Whole Food Can Make! 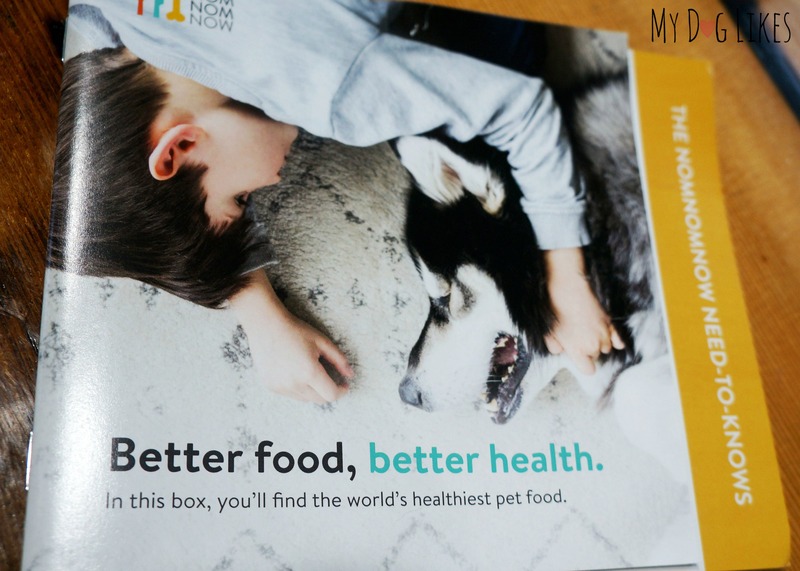 NomNomNow has sponsored this post and sent a shipment of their food for us to try. All opinions are our own and brands are not guaranteed a favorable review. For the better part of the last five years, I have spent time researching and learning how I can eat healthier as well as provide nutritious meals that my family will enjoy. As a new mom, I portioned out my baby’s pureed foods and was paranoid about giving her the perfect protein/veggie/fruit balance. Three babies and three years later, I found that with each new mouth to feed, the level of urgency for balanced nutrition diminished. Like most parents, we do the best we can, but there is only so much time in the day! 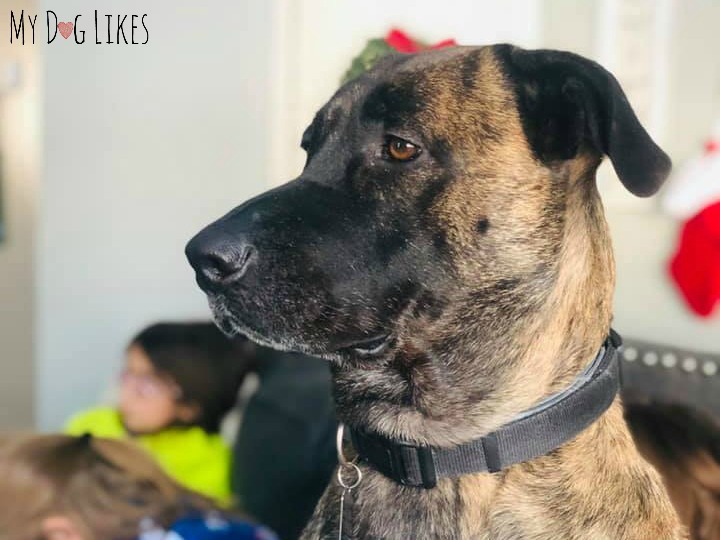 Our furry family member is a 90lb shepherd/pit-bull mix named Rocky, who came into our lives suddenly a year ago when a rescue organization reached out to us and said he needed a home ASAP. We started Rocky with what we thought to be the healthiest, affordable bagged dog food we could find in the stores. He experienced a lot of digestive problems in this early time with us and through some digging, I was able to obtain the name of the food he had been fed since birth. 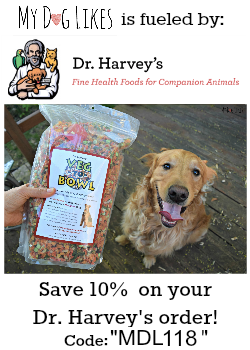 Though this food wasn’t what I considered the healthiest formula, Rocky didn’t seem to have any issues after eating it and that is what we have given him for the last year. Somewhere in my conscious, however, I had this nagging feeling that just as we humans can survive on processed foods, it doesn’t necessarily mean that is what we SHOULD be eating. Why wouldn’t it be the same for our pets? NomNomNow is a pet food company that creates nutritious whole food recipes and delivers them to your door in individually portioned meals. I was recently given the opportunity to test out their food and after taking a quick look at their site jumped at the chance! This is the type of food you would cook for them at home (if you could) and will no doubt feel good feeding to them. They offer plans for dogs AND cats – which sets them apart from most other dog food delivery brands. 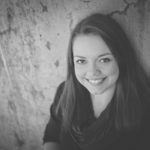 Learning about balanced nutrition can be overwhelming and I’ve often found that there is so much conflicting information available that many give up on pet nutrition completely. I was encouraged, however, when visiting the NomNomNow website as it clearly answers every question I could think of, such as how to find and formulate the proper balance my pet needs, why each type of food is beneficial, and how my pet’s needs change as they age. 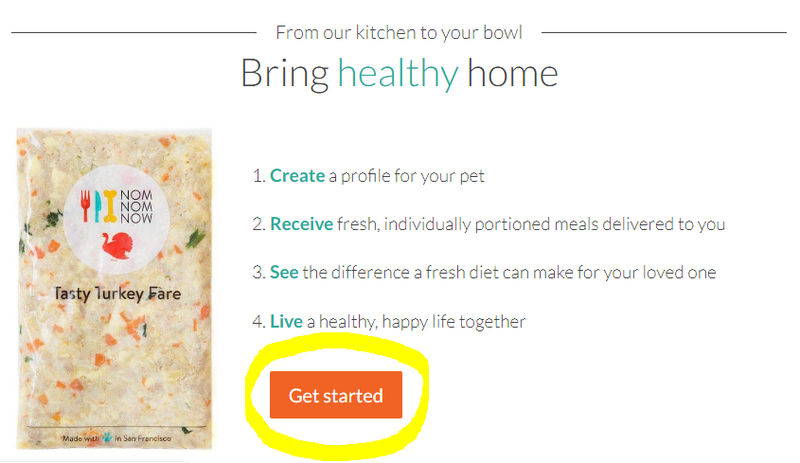 Right from the bottom of the home page, you can click on “Get Started” where you then enter your pet’s name, weight, goal weight and whether he/she is a dog or cat. Suggested options for food choices are then given as well as the cost needed to properly feed your pet every week. 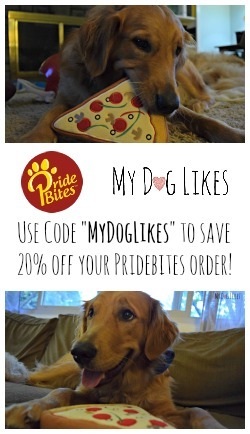 A discount is available if you choose the 2-week delivery option over weekly as well as a one-time 20% off discount for the first two-week order and a free bag of treats! As a straight-shooter on a constant time crunch, I really appreciated how quick and easy this was! If your pet has any allergies or health issues a Help Center phone number (415-991-0669) and e-mail address are available for you to speak with someone one-on-one to make the best plan for your pet. After the order is placed, the food is prepped from fresh ingredients, bagged into sealed packages and shipped cold right to your door! 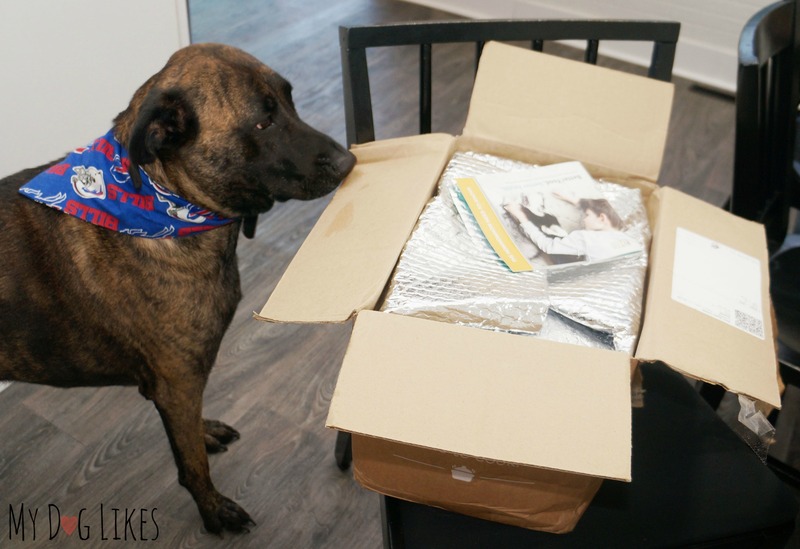 It only took a couple of days for the first order to be delivered to our doorstep, and from the moment it arrived Rocky wanted to know what was inside. Two doors separated Rocky and the NomNomNow box and he was NOT going to let us waste any time getting it inside the house. We immediately brought the box in and opened it to find clean packaging and a booklet of information giving step-by-step instructions for an easy transition. Rocky didn’t care about transitioning; his tail was wagging in anticipation as the aroma of fresh food filled the room. 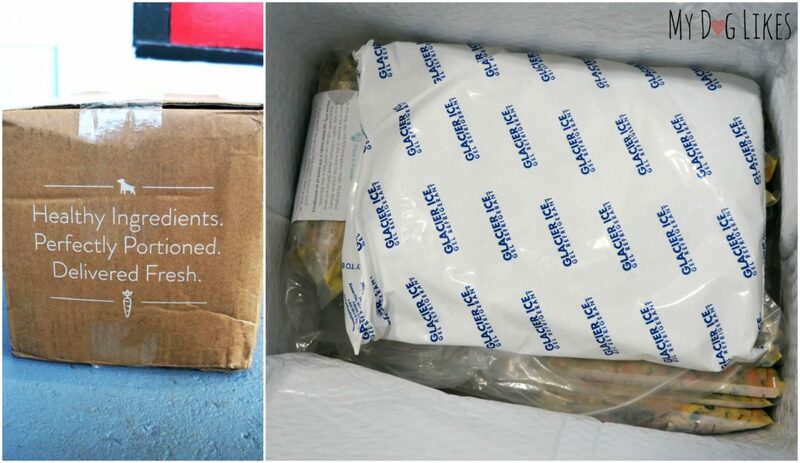 I was impressed to find that every part of the packaging from the insulated freezer packs to the actual bags used to hold the food is all recyclable. NomNomNow has clearly done immense research to ensure that their company provides quality that is health and eco-conscious on every level. My first thought as I pulled out a sealed package of Chicken Chow-Wow was that this looked like something I would feed myself! I peeled open the first package very easily and was intoxicated by the freshness of the ingredients. I was both excited and a little jealous as I poured the mixture into Rocky’s bowl, mixing it with the food he was already accustomed to. Rocky loves to eat fruit but tends to be pickier with fresh veggies so I was interested to see if he would eat the chicken and leave the veggies. To my surprise he slurped down the entire first feeding, licking his bowl clean! Rocky was given his first portion of Chicken Chow-Wow in the evening on the day of delivery and by the next morning he was my shadow. Usually Rocky will lay on his bed until the girls have left for the day and then slowly get up and stretch as I coax him to the door for his walk. On day 2, I could not move fast enough for him as he wagged his tail, ran through his walk and came pouncing through the door to the fridge in anticipation of what he knew was in there! I’ve always thought of Rocky as a happy and playful dog but instantly this transition to NomNomNow gave him an extra pep in his step. To my surprise Rocky showed clear positive changes all around within 3 days. Over the summer we struggled with intense heat and “super fleas” not common to our area, both of which seemed to be an issue for many of our neighbors and friends. In the process of trying to keep Rocky comfortable during all of this, we noticed his skin had become extremely dry. A simple touch to his coat would leave a handful of dry skin. We had tried different remedies suggested by friends, but nothing seemed to give Rocky relief. Within 3 days of eating the Chicken Chow-Wow mix, Rocky’s dry skin was alleviated and within one full week it was completely healed and shiny. The positive changes Rocky has had in his first two weeks of eating the fresh NomNomNow food have been incredible! His digestion has settled into a more predictable routine of bowel movements, his energy is through the roof, his coat is shinier, and skin healthier. I am astonished by this transformation and after reading more on the NomNomNow website, I’m almost embarrassed to not have expected these changes. I am reminded of the transformations I’ve seen in humans on their health or weight-loss journeys. 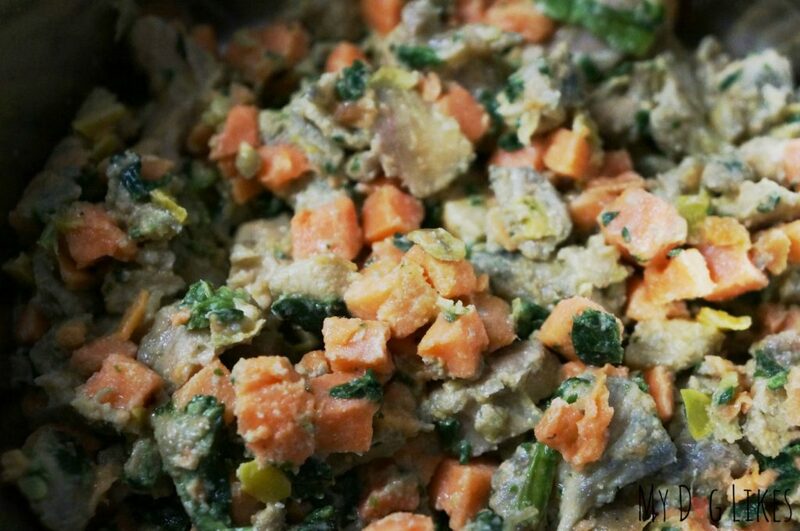 When we eat better, our bodies thank us, and it is no different for our pets! 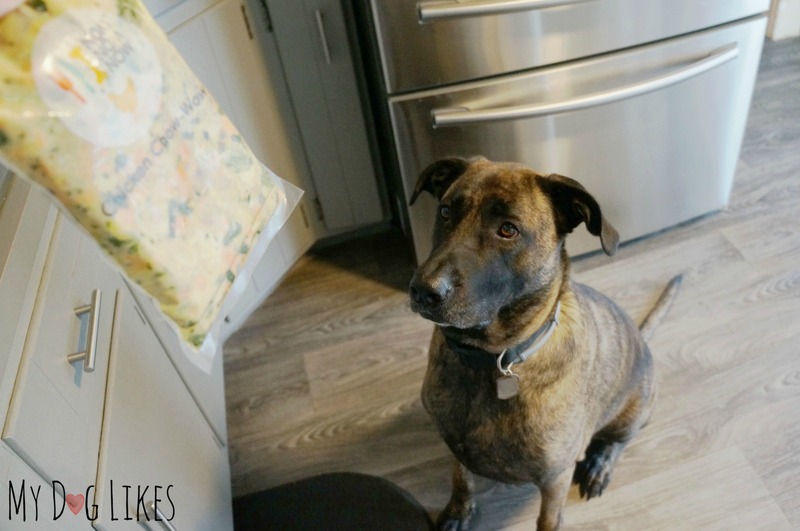 NomNomNow’s pricing is par for the course when it comes to this genre of food, though as a family of five living on a single income, we will not immediately be able to maintain a full meal plan for Rocky. However, after this experiment I cannot simply take this food away from him! Initially I thought about prepping my own versions of this food but after much research it is neither cost effective to buy the ingredients nor do I have access to the expertly formulated nutrition blend added to each serving. It’s obvious that this company has done its research and found what works! 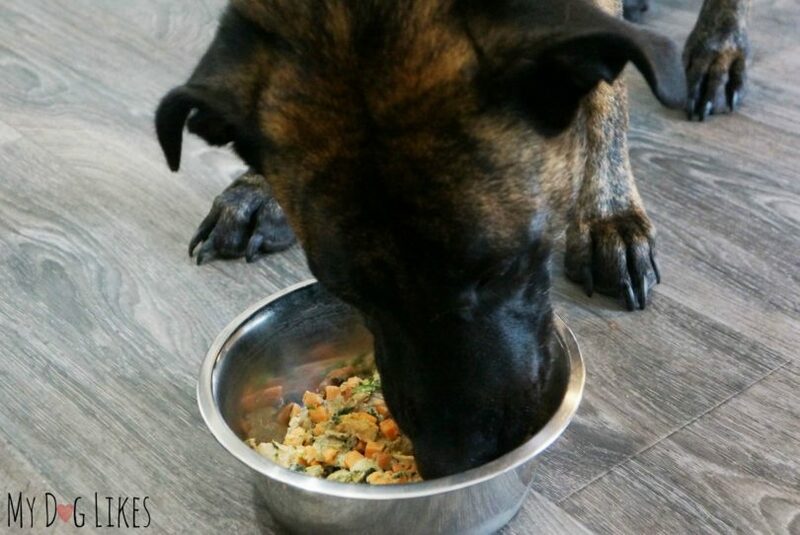 My plan going forward is to order enough so that Rocky can enjoy the meals he loves 2-3 times a week, giving him some of this delicious nutrition while not breaking our weekly budget. Every little bit helps, and we want to do what’s best for him! Want to give NomNomNow a try? Hi, there! My name’s Corinne and I am the proud fur-mama to a pit bull/shepherd mix named Rocky! Rocky is three years old and he is a spunky, smart, protective, and loving rescue dog. I found Rocky one year ago when searching through local adoption agencies and his story of neglect and abuse was so heartbreaking that we immediately went into action and were given custody of him. Our first year as a family of six has been filled with many adventures! Rocky has become best friends with his three human big sisters and taken on a different role with each one. With Loreli (8), he has become her protection in the dark nights as she separated from her sisters for the first time and welcomed Rocky to snuggle her each night. For Charlotte (5), Rocky has become the only family member who can keep up with her energy! Perhaps the most special role Rocky has found himself in is as the one and only friend to our middle daughter, Evalyn (7). Evalyn is diagnosed as low-functioning on the autism spectrum as well as a genetic growth disorder which affects every aspect of her bone and muscle growth. Evalyn struggles to connect with other humans but Rocky has found a bond with her that can only be described as two souls meant to be together. Our giant furbaby often forgets his size and strength but never falters with his special girl! We changed Jake our dogs food from dry to whole foods and made a big difference to his health. Especially his energy and shinier coat, like you mention with Rocky. Thanks for the tips!